He embraced the dichotomy of the world being a really big place and a small planet all at the same time. I learn so much by opening up to the stories and perspectives of ranchers, farmers and fishermen, of public officials, of folks in all manner of businesses whose work depends upon our rich natural resources. The world needs more Anthony Bourdains – people who are respectful of others and are willing to build on-ramps to solutions instead of walls. What I aspire to is the grace with which he was able to meet people where they were and, at the same time, challenge preconceived notions – whether that might be getting Anderson Cooper to try blood sausage or giving CNN viewers a more intimate view of what it’s like to live in West Virginia. The environment, like food, isn’t a black and white issue. It is, at its core, something that naturally binds us together – something that, just like food, sustains life on Earth. Yet, it can be twisted to be something that divides us. A decade ago, my colleagues and I produced the seafood selector – wallet-sized cards that provide people interested in sustainable fishing practices with an independent and handy summary of the status of some popular fish. However, I cringe when people feel put on the spot to make the “right” choice or, worse, feel like they are a bad person for wanting a fish dish not on the seafood selector that, perhaps, reminds them of a meaningful time in their lives. He’s right. Things like the seafood selector help consumers send signals to the market – and I believe market signals have impact. But guilting people over what fish they pick for dinner is as likely to shut them down as it is to open them up for a conversation. Amazing things can happen when we have conversations. My colleague Eric Holst once told me how he wanted to open up a dialog with a group of farmers in California’s Central Valley, but was having trouble getting farmers to be seen – let alone talk – with an “environmentalist.” One bold farmer finally agreed but insisted they meet at a Howard Johnsons coffee shop. 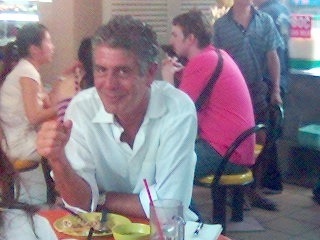 I imagine that conversation happening over a blue plate special, something Bourdain might have done. From that shared coffee, the humble beginning of a strong partnership between EDF and that farming community emerged. To be sure, we don’t agree on everything. But we can talk with each other. Each time we do, I feel like we learn a little more. Conversation is no magic potion. Many of the issues we, as a society, struggle with are rooted in equally valid but competing values. Bourdain’s genius wasn’t a blithe Pollyanna. It was about showing us what it could look like to engage with someone even when the topic might be a challenging one. The world needs more Anthony Bourdains – people who are respectful of others and are willing to build on-ramps to solutions instead of walls that separate us from each other. This entry was posted in Partnerships and tagged Anthony Bourdain, bias, collaboration, conservation, conversation, Don't Eat Before Reading This, environment, food, Kitchen Confidential, Parts Unknown, sharing a meal. Bookmark the permalink. Both comments and trackbacks are currently closed.